8. Publish a page to a local web site. 1. a Site template is a developed web site that you can customize for your own purpose. 2. A page template is an existing web page layout that you can modify. 3. a style template is an already created CSS style sheet that is ready for you to attach to a web page. 4. The CSS box model establishes a web page layout buy creating rectangular or square regions for content. 5. Dynamic Web Template is an xhtml base master copy of a web page that can be used to create settings, formatting, and page elements. 6. Editable regions areas where the content can be changed. c. Select the template you want. d. click in the specify the location of the new web site and type in the location or browse to it. 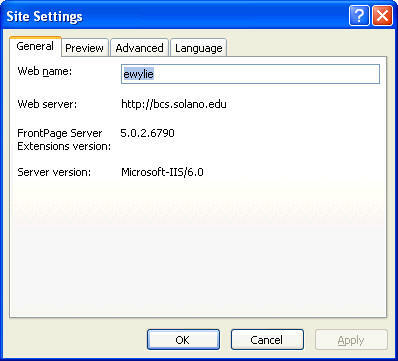 a. here you can change the web site name and other advance settings. e. edit the style in the modify style dialog box. 10. To attach a dynamic web template to a new page. click format on the menu bar, point to dynamic web template, click attach dynamic web template. 11. Template layouts - predefined page layouts tat will create page divisions for you using <div></div> tags. Each division can have separate content. c. click Ok, and the files will be added to the web site. Press F5 to refresh the folder list in the web site. 13. Copy and past content from one web page to another. a. Select content to be copied by dragging mouse, control-a if you want all the content or hold your shift key down and use arrow key to select content. b. Control-C to copy or right click, click copy. c. Put cursor where you want content to be copied in web page. d. Control-V or right click, click paste. 14. Create a new division- enter the content, select the content for the division, click the <div> button in the toolbox task pane, right-click and then click wrap. b. click file on menu bar then save as. c. click the save as type list arrow. 16. Creating an editable region in the dwt. a. right click the area of the dwt where you want an editable region. 17. Publishing a web site - transferring your file from the hard drive to a web server. Expression web keeps track of which files have been published, where they have been published, and the date the files were published. 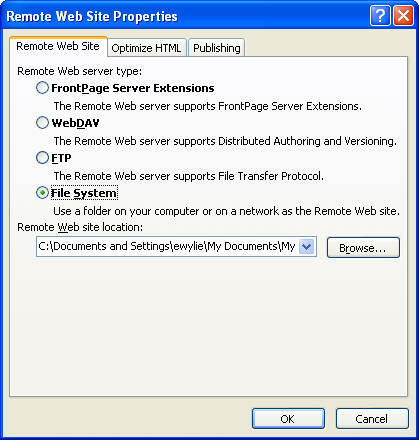 b. FrontPage Server Extensions- select this option if you are publishing to an IIS server. you will see: Type in the remote web site location in the text box or browse to it. c. File system - select this option if you are publishing to a folder on your computer or the network server. you will see: Type in the folder location in the text box or browse to it. e. Once you identify the new publish location click open or ok.
f. Local to remote - publish from your hard drive to a remote location. h. synchronize - transfer files from the remote that are new to the local and transfer files from the local that are new to the remote. j. 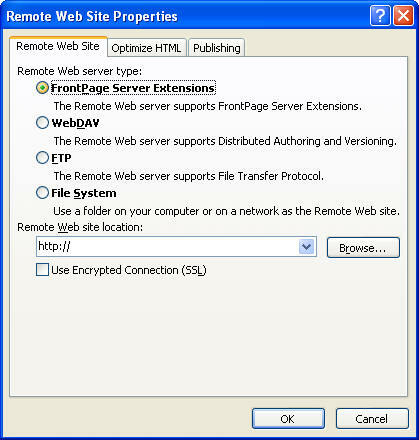 Open your remote web site in expression web. k. Publish web site- click on this to publish after you have selected the appropriate site.